This is my first Christmas without my mother. Mom died suddenly in mid-September, three months before her 75th birthday. 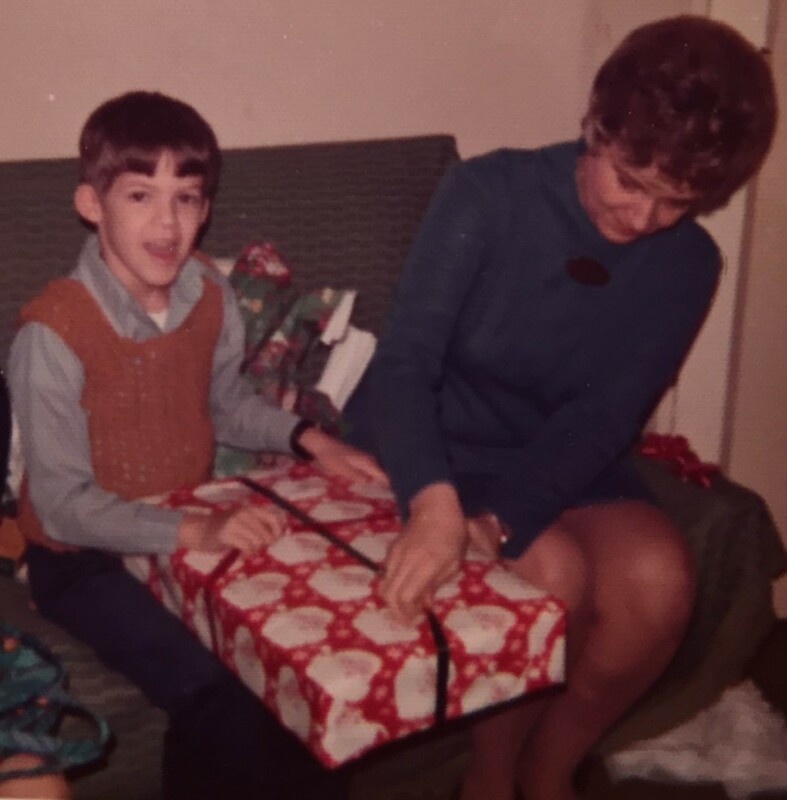 For Mom, the holidays were less about Santa than stress. The yuletide anxieties began around Labor Day, when she’d fret about finding the perfect gift, and finding the time to find the perfect gift, and whether she’d bought enough perfect gifts. This quest for a flawless Christmas probably stemmed from an impoverished childhood, but anxieties ruled her life. When Mom wasn’t worried, it would worry her, because she knew she should be worried about something. We discussed it before the holidays last year. Mom was suffering her usual bout of pre-Christmas, do-you-fear-what-I-fear nerves. I’m convinced that people recall the traditions more than the gifts. I can’t tell you what presents I received at age seven—wonderful though they were—but I can picture the Christmas Eve candlelight church service, the flames serene, glowing in the darkened room. I remember going to our neighbor’s house afterwards for some evening hyperactivity. I can taste Mom’s fudge and sugar cookies. (Mom loved sweets: she was the kind of woman who would eat a cinnamon roll for dinner.) I can see her enduring Charlie Brown and the Grinch as I watched in footy pajamas from the couch. More than anything, I can hear “Blue Christmas.” Mom was a devout Elvis fan. When I was eight, my parents took my sister and I to see Elvis in concert, a pilgrimage similar to Catholic children seeing the Pope. I’ve caught myself singing “Blue Christmas” this holiday season, and it leaves me both happy and sad. Because this is a blue Christmas without her. And that’s a challenge. There’s so much pressure to be jolly this time of year, to submerge your sorrow, to not be dubbed a scrooge. But the holidays aren’t just about sugar-plum frivolity. Yes, it’s a time of fun, and a time of giving. But it’s also a time of remembrance. The first Christmas after Dad’s death, Mom and I took a wreath to his grave. The gesture was more important to Mom than to me. I don’t think the dead want us loitering in cemeteries—they want us to live and laugh and to feel heartache and bliss and to revel in our brief existence on the planet. But for mom, placing a wreath was a symbol of dedication and respect. It showed that we loved him. And she was right. So we drove to the cemetery and walked up a grassy hill to Dad’s grave. It's a pretty cemetery: The markers are flat, the landscape uncluttered by tombstones. Korean and Vietnamese families hang wind chimes for loved ones. The chimes sing, softly, almost like, well, sleigh bells. I pushed the wreath stand into soft dirt—the ground was damp from rain. “Are you sure it’ll stay,” Mom said, forever worried. And the wreath-laying tradition will remain as well. My sister and I placed a wreath at my parents’ grave on Mom’s birthday, December 4. I like this new tradition, as much as I do eating cookies and watching Peanuts. Because just as that wreath-stand holds firm in the earth, our traditions, whether solemn or silly, ground us in a warm past, linking us to loved ones, childhoods, memories. So here’s my holiday advice: As you’re scurrying to shopping malls and stressing over gifts, take time to stop and smell the fudge. Cherish your family and friends, because that’s what you’ll remember when the gifts are gone from the tree. Find joy, and give joy, and give to those who need it. “Peace on Earth, goodwill toward men” is not a greeting card mantra. It’s the ultimate holiday tradition. Ken Budd is the host of 650,000 Hours, a web series launching in 2016. He is the author of the award-winning memoir The Voluntourist and his writing credits include The New York Times, National Geographic, Smithsonian, The Washington Post, and The Chicago Tribune. Click here to subscribe to the 650,000 Hours blog. We Get 650,000 Hours of Life.